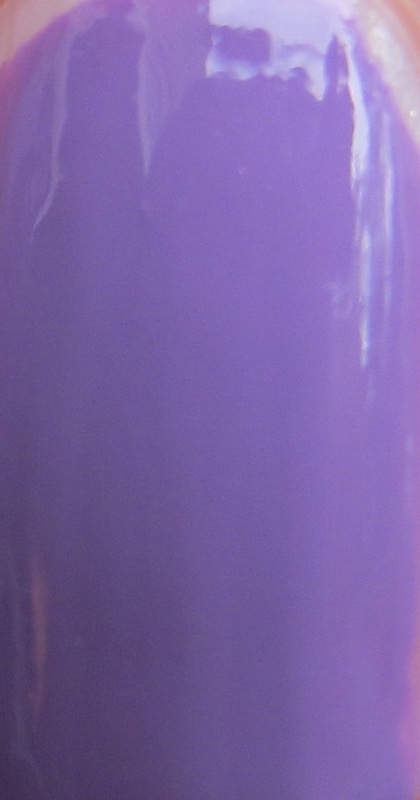 Today's post is another fabulous drugstore find, Rimmel Lasting Finish Pro in Wild Orchid. You saw this yesterday underneath Lynnderella The Glittering Crowd, but it's pretty enough to get it's own post!! I wore this under The Glittering Crowd for several days and really loved the bright lilac color. It was so cheery, especially with all of the sparkling glitter on top! This is two coats of Wild Orchid and it's nicely opaque. It goes on pretty opaque with one coat, but it needed a bit of evening out, so I did need to add the second coat. The formula is nice and smooth, with no real difficulties at all. The large brush really makes for easy application once you get the hang of it. This color is maybe a tad brighter in person and not as dusty as it looks in these pictures. It's a great color for all seasons and one that could suit a variety of occasions. It's fun without being over the top or obnoxious, and can still look lady-like as well. I really like the three Rimmel Lasting Finish Pro polishes I've posted (Pink Zinfandel, Rags to Riches) and I'll certainly be checking the displays in the drugstores for more cool colors in this line. Do you own any of the Lasting Finish Pro polishes? Which one is your favorite? This polish was sent to me for review by a PR agent for Rimmel London. For more information, please read my Disclosure Policy. This is a great color! Imfeelingnail-venturous- it is really pretty! Just one of those nice, cheery colors. Thenailholic- it would be perfect for spring! I can see it with some white Konad flowers on top! China Glaze Haunting Collection Preview! Sally Hansen Goes Backstage At Fashion Week! Sally Hansen Insta Dri in Teal-y Fast NOTD! OPI Kicks Off Fashion Week! Zoya Gems and Jewels Preview! Sally Hansen Pumpkin Spice- A Lemming Satisfied! Sephora Fashion's Night Out News!